You should know that at StoreYourBoard we have tons of different options for SUP racks for your home, garage, deck, dock, boat, etc. But we also have lots of different SUP paddle racks for storing your paddles! Anyone that has a paddleboard needs a wall paddle rack to hold their paddles for the same reason that they need a SUP rack - to store your paddles safely and keep them in great condition for when you want to use them. Our handcrafted cedar wood SUP paddle wall rack is really top notch, with a great make, design and finish. Get it in sizes for 1, 2, 3, 4, 6 or 8 paddles! Another wood paddle wall rack, this one holds paddles out from the wall, rather than on top of one another. 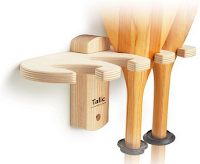 Great looking SUP paddle holder with storage for 4 paddles. This rack is a bit different - it's a car SUP paddle holder so you can rack your paddles to your roof along with your SUP boards. It fits on a variety of crossbars and comes with a locking cable to keep your paddles safe and secure on your next trip. Vertical Paddle Racks: We have different options if you want to store your paddles vertically, depending on the make, finish and number of paddles to store. 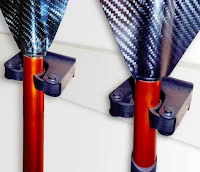 This paddle wall rack is basically a "U shape" holder that screws into your wall for your paddles. It is rubber coated for protection and comes in three different sizes - to hold 2 paddles, 4 paddles, or 8 paddles. 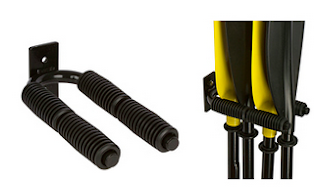 Another SUP paddle rack set comes with 2 holders that each hold 1 paddle individually. Or check out this paddleboard paddle rack - it's made of wood - aesthetically pleasing - and holds 4 paddles. For the veteran paddleboarders and SUP retail or rental stores, we have a a circular SUP paddle rack that holds 18 paddles! StoreYourBoard Celebrates its 6th Anniversary!